All our ANSI First Aid kits comply with the ANSI Standard Z308.1-2003 for workplace first aid kits. These are the standards set forth by the American National Standards Institute (ANSI). 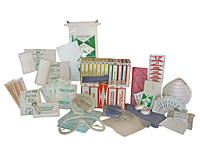 We offer discounts on bulk purchase of the ANSI first aid kit. Our ANSI first aid kits are well suited for small to large companies and vehicles. The ANSI kit comes in metal or plastic casing which is easy to carry during emergency situations and also easy to store. Height: 7" by Width: 10"
Height: 9" by Width: 7"
- Available in Metal or Poly box. Bulk Discount, purchase 3 at only $16.90 each! Bulk Discount, purchase 3 at only $26.99 each! Bulk Discount, purchase 3 at only $23.99 each! Bulk Discount, purchase 3 at only $37.95 each! Bulk Discount, purchase 3 at only $45.99 each! Bulk Discount, purchase 3 at only $19.03 each! Bulk Discount, purchase 3 at only $59.99 each! Extra large, 50 Person, Bulk ANSI First Aid Kit, plastic case. Bulk Discount, purchase 3 at only $22.79 each! 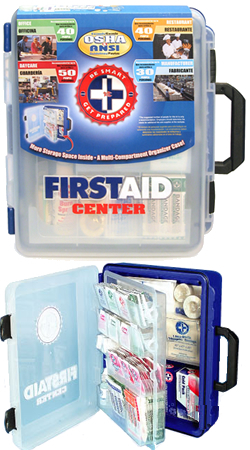 This 46-piece, 10-unit ANSI compliant first aid kit holds all 8 ANSI required items in a plastic case with gasket. The kit also includes a 4" X 5" cold compress and 72-page First Aid Guide booklet published by the American Medical Association. Meets ANSI 2308.1-2003 requirements. This 46-piece, 10-unit ANSI compliant kit holds all 8 ANSI required items in a sturdy metal case with gasket. The kit also includes a 4" X 5" cold compress and 72-page First Aid Guide booklet published by the American Medical Association. Meets ANSI Z308.1-2003 requirements. This 94-piece, 16-unit ANSI compliant first aid kit holds all 8 ANSI required items and is designed for use in small offices, vehicles and work sites. A list of contents can be permanently affixed inside the lid for easy restocking. The case features a gasket and an easy-to-carry handle, yet is also wall mountable for quick access in an emergency. Contents fit snugly to prevent shifting, and single-use packaging ensures that products do not become contaminated. Meets ANSI Z308.1-2003 requirements. This 94-piece, 16-unit ANSI compliant first aid kit holds all 8 ANSI required items and is designed for use in small offices, vehicles and work sites. A list of contents can be permanently affixed inside the lid for easy restocking. The case features a gasket and an easy-to-carry handle, yet is also wall mountable for quick access in an emergency. Contents fit snugly to prevent shifting, and single-use packaging ensures that products do not become contaminated. This kit meets ANSI Z308.1-2003 requirements. This 148-piece, 24-unit ANSI compliant kit holds all 8 ANSI required items in a sturdy metal case. A list of contents can be permanently affixed inside the lid for easy restocking. The case features a gasket and an easy-to-carry handle, yet is also wall mountable for quick access in an emergency. This kit meets ANSI Z308.1-2003 requirements. This 105-piece, 25-person bulk kit meets all OSHA and ANSI standards, and is designed for use in small offices, vehicles and work sites. The partitioned, water-resistant plastic case is wall-mountable, yet has a handle for easy carrying.This kit meets ANSI Z308.1-2003 requirements. This 194-piece, 36-unit ANSI compliant first aid kit holds all 8 ANSI required items in a sturdy metal case. A list of contents can be permanently affixed inside the lid for easy restocking. The case features a gasket and an easy-to-carry handle, yet is also wall mountable for quick access in an emergency. This kit meets ANSI Z308.1-2003 requirements. This 193-piece first aid kit is ideal for contractors, fleet vehicles, work sites or small companies with up to 50 employees. It meets federal OSHA recommendations and carries 20 critical products. The plastic case, with slanted, spill-proof dividers is wall mountable yet has a handle for easy carrying. This kit meets ANSI Z308.1-2003 requirements.